Charles was born in October 1879 (birth certificate number 1879/15566) in Auckland. Not much is known of his childhood other than we could expect it to be much the same as other children at the time in Auckland. The first record we have of John is in the Electoral Roll of 1905, where he is recorded as living on Nelson Street and operating as a merchant. In 1907 John marries Ocenia Victoria Saintly (Marriage certificate number 1907/87), in Auckland. Later that same year John and Ocenia have their first child, John Chetwyn (1907-1986). 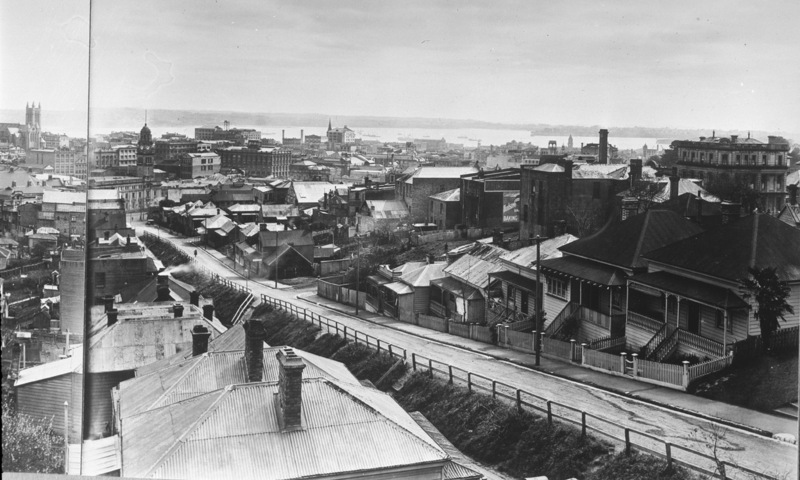 Looking east south east from the Banks Box Building in Wakefield Street showing Wakefield Street (diagonal far right), Langford Brothers, grocers (far right), Mrs E G Dawson boarding house on the corner of Lyndock Street (centre right), Globe Hotel (centre), Mount Eden (far right distance) – Sir George Grey Special Collections. By 1908 John is moving into the Hotel business. In the New Zealand Herald 24 October 1908 he applies for the transfer of Licence for the Globe Hotel on Wakefield Street, Auckland, which is approved on 2 December 1908. “A BOLT FROM THE BLUE.” – DIFFICULTIES OF HOTELKEEPERS. ;(By Telegraph—Special Correspondent.) Auckland, December 6. At the quarterly meeting today of the Auckland Licensing Committee, the police report concerning the City Hotel (licensee, “Walter Stimpson) and the Globe Hotel (licensee, John Ernest Parker) stated that the houses were frequented by women of a low class. Mr. J. A., Quinn appeared for Mr. Stimpson. Sub-Inspector Hendry remarked that inspecting police officers had found women of low class in the hotels drinking. The effect of this could only lie to bring men of lower class about the houses, and to make the houses haunts for idle, disorderly people. He suggested that the licensees could get over the difficulty by refusing to sell to women any drink for consumption on the premises. Front view of the Globe hotel (far right) – Sir George Grey Special Collection. Mr. Quinn said that the complaint had come to his client as a bolt from the blue. He urged that Mr. Stimpson was a proper man to conduct a hotel, and that no licensee could possibly distinguish the reputable from the disreputable woman. Mr. Parker appeared in person. He had had the same difficulty as that mentioned by Mr. Quinn, and he had decided to adopt the suggestion offered, by the sub-inspector. The Bench were satisfied with the explanations offered. John continues on as the Hotel Proprietor of the Globe Hotel until 1914. He transfers the Globe License to a Mr. Bernard Douglas. The New Zealand Herald on 4 August 1914 made notification of this. This same year Ernest Saintly (1914-????) son number 2 is born in April 1914. Then again on 4 December 1916 a daughter is born Alma Ocenia Saintly (1916-1976). By 1919 we have John living at 86 Clarence Street, Ponsonby and working as a contractor. Then by 1928 still living at 86 Clarence Street in Ponsonby, but now working as a millwright – A millwright is a tradesperson who installs, maintains and repairs stationary industrial machinery and mechanical equipment by interpreting drawings, performing layouts and assembling parts until they are in perfect working. 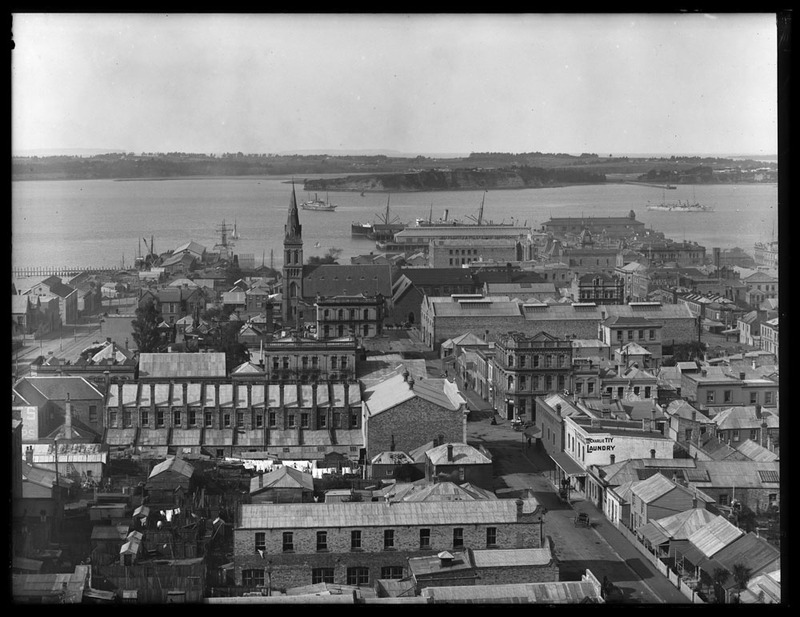 Looking north from St Matthews Church over the city and harbour to Stanley Point showing Hobson Street (extreme left), Hobson Wharf, Chapel Street (Federal Street, right) with St Patricks Cathedral (centre) and premises of Alexandra Hotel (centre) Aurora Hotel, J H Hannon and Charlie Tiy (right) in Albert Street – Sir George Grey Special Collection. In July 1932 John ventures again into the Hotel business, this time the Alexandra Hotel at the corner of Federal and Kingston Streets in Auckland. This was approved by the Quarterly Licencing Meeting and notified on 7 September 1932. John remains the Hotel keeper until 1940, when he transfers to his son John Chetwyn Parker. The Auckland Star ran the notification on 26 September 1940. By 1946 John has retied and spends his time between a property in Cornwallis Beach, Waitakere and 86 Clarence Street, Ponsonby, until his death. John dies on 21 January 1961 aged 81 (Death Certificate Number 1961/20968), and was cremated at Waikumete Cemetery, Auckland. Ocenia out lives her husband, her last known address was 46 Islington Street, Ponsonby. She dies 1 September 1973 aged 91 (Death Certificate Number 1973/32215), also cremated at Waikumete Cemetery, Auckland.